From commanding Green Berets in wartime to serving in the White House and in the Immediate Office of the Secretary of Defense, John Fenzel’s qualifications and experiences are both unique and first hand. He has commanded numerous Special Forces organizations, leading the first-ever deployments to Pakistan and the Baltic States. In the war-torn country of Bosnia, he commanded Special Operations Forces in the U.S. and British sectors, working closely with the United Nations to secure the indictments and convictions of those responsible for war crimes in Srebrenica. His inspiration for The Lazarus Covenant camewhile serving as Special Assistant to the Vice President and Staff Director for the Homeland Security Council. 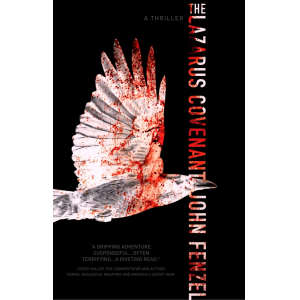 He wrote The Lazarus Covenant totell the compelling story of how the war on terrorism is truly fought at all levels, in all dimensions—by ordinary people in extraordinary, often desperate, circumstances. John Fenzel remains on active duty as a senior Army Special Forces officer. He lives in Washington, D.C. with his wife and three children.